Every Day Simple – Living. Growing. Loving. This service, unlike others in so many ways, captures as much of our Christian story as it can, which is why it is longer and why I’ll keep this brief. We move from creation to the empty tomb in one fell swoop, and what do we do with that? Do we leave this place like we’re clicking the remote, getting up from our seats saying, “Well, that was nice”? I dare say that if you are fully engaged throughout this service, for at least a moment, your heart and soul are stirred. For if anything is true about what research claims about cellular memory, these stories are written in our hearts, so to speak, or at least in our cells. So the story of our ancestors, of the Hebrews, of the women, of the apostles, of Jesus are all part of our story, very much a part of who we are. This story of ours isn’t meant to be kept in the dark. We know for ourselves what is real, what is true. Like I shared last night, I’m as skeptical as anyone when laying claim to what is really real, but when something grabs hold of us and speaks to us like nothing else we’ve ever known, we pay attention. As our Christian Education lecture series says through Prof. Bart Ehrman, what happened in the past might not be counted as history, as what can be proven with evidence and supported with scholarship. The exodus and Passover are taken as history, the raising of the dry bones not so much. The person of Jesus of Nazareth, even his crucifixion under Pontius Pilate, are history, but his resurrection leaves historians in a quandary. Perhaps it has you in one, too. What exactly are we celebrating this Easter? 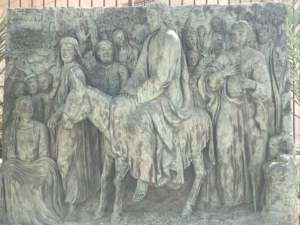 Jesus’ houdini-an act of rising from death and fleeing the tomb? What we celebrate this Easter Vigil is the light of life coming from even the darkest of times. It’s why we start from creation, for the ultimate void to the generation of life. It’s why we remember the Exodus, the liberation from oppression and despair. It’s why we aren’t afraid to talk about death, a most natural part of the life cycle. It’s why as Christians we remember our baptism, because it is one way that we die to ourselves, giving ourselves over to life in Christ. We are given new life, new birth. It’s not a coincidence we celebrate this in spring, when everywhere we look, new life is rising from the darkness of the earth or from branches that looked all but dead. Maybe like the disciples, you think this resurrection hope is an idle tale, an opiate for the masses, giving false hope to make people feel better about the nightmare of life in this broken world. Chances are if you’re here, that’s not your perspective, but we all have days when we’re not our most optimistic. I have days, too, when I wonder if all that I work for and strive for is worth it. But even in death, there are things we do, making arrangements, preparations. A few take care of this, like the women going to the tomb; it’s usually the few who were closest. And we can close that chapter of our lives, or we can reflect on what it means for us that one we loved so much has taught us things we’ll spend the rest of our lives processing. 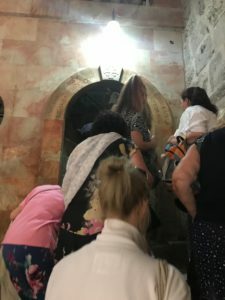 But what if we were the women at the tomb, and what we expected to see wasn’t what we faced? What if what we thought was the end of the story, the death of our Teacher and Lord, wasn’t so? What if we then remembered, after being prompted by another, that Jesus had actually told us this would happen, that he would rise again? Wouldn’t we tell others? And wouldn’t they in their despair question us, write us off as crazy or making up idle tales? But love is a strong thing. Even after death, don’t we hope for a sign from our beloveds that they aren’t truly gone from us, even if it’s in our dreams? It’s blessed Peter, isn’t it, who acts first and thinks about it later. Peter, who had denied Jesus three times and regretted it deeply. He gets up and runs to the tomb. Now, according to this gospel, he doesn’t immediately go back and credit the women, apologizing for not trusting them at their word. But he goes to his home, his place of safety, and we end with him in amazement today. When we think we know how the story ends, we can tune out or fall into our habits and routine. But this story doesn’t end. It goes on. The devotion of the women, the discerning of the disciples, the searching for themselves for the truth, the questioning, wondering, and amazement: all this is ours, too. All this is fuel for our hope that life triumphs over death, that light prevails in the darkest of times. If those of us here tonight have to be reminded of the hope of our story, how many others who aren’t here could us a few words to remind them that they are part of our story, too? For the love of God that couldn’t be held in a tomb certainly isn’t just for us but is open for all the world. Our story is nothing less than a love story, radiant with the light of Christ, written upon our hearts. My senses stood on edge at the first foot-washing I experienced in a church (St. Paul’s, Fayetteville). I had never done it before but trusted the clergy in their invitation to the holy days leading up to Easter, to participate fully in all that was offered. I looked around at others who seemed so calm, as if what we were about to do was normal. In the church, Baptism and Eucharist are normal; even in the church of my youth I had at least had one Communion. Jesus told us that we were to be baptized as he had been and that we were to take the bread and cup in remembrance of him; this is standard issue. So what do we make of this where, according to the Gospel of John, Jesus plainly says, “I have set an example, that you should do as I have done to you”? What Jesus has obviously done is kneel before his disciples and wash their feet in an overwhelming act of love. On Sunday I encouraged us all to pay attention to Jesus’ acts of love throughout Holy Week, and in his act of washing his disciples’ feet, we witness a great and powerful act of love. In this act of love, Jesus says many things, verbally and non-verbally. What Jesus knows is that the time is coming for him to die, and he is resolved to love his friends and followers through to the end. How is he able to do this? He has the assurance of his place in God, his confidence that he not only comes from God but is going to God; he is not bound by this world. With this assurance, he gets up and washes the feet of those gathered with him, even arguing with Peter, telling them that he knows they can’t fully understand this now, but they will, later. Later they will understand the paradox of their Teacher and Lord serving them and the significance of the servant not being greater than the master, nor the messengers greater than the one who sends them. Jesus washing the feet of his disciples wasn’t just about role-reversals on that one night long ago. In one exemplary act, Jesus encourages a letting-go of expectation, puts those who think we understand in the uncomfortable position of not knowing and in a position of vulnerability. If letting go of a sense of order and control wasn’t uncomfortable enough, giving your feet over to the one whom you regard as your Teacher and Lord certainly is. Jesus, in his tenderness and love and assurance in God, created a safe space that night to plant a seed for new understanding. 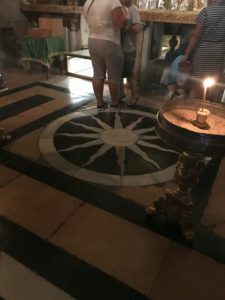 In a place of safety and security grounded in God’s love, Jesus offered a moment of transformation, illustrated in Peter’s move from not wanting Jesus to wash his feet to wanting to be washed head to toe in the waters his Lord offered. Like Peter, we still have much to learn, much to understand. Accepting our own lack of understanding of all that Jesus stands for and all that he offered and showed to us, letting go of a sense of control and of vice-grips on what we deem acceptable, let alone taking off our socks and shoes to let an acquaintance pour water over our feet at the end of the day, all of this puts us in a position of vulnerability, and our culture equates vulnerability with weakness. Our culture equates love with weakness. But we know that being vulnerable means being open. Being vulnerable means we have the opportunity to take a risk, to be brave, to be courageous. We know that being vulnerable means that we have the capacity to be in relationship with another, which means that only by being vulnerable can we experience and understand true love. And we know that true love is powerful. The bonds of love defy reason and even time and space, which may be why Jesus wants us to do this, too, this act of love. I wash your feet. You wash mine. We share this act of love in the name of Jesus, for love of God, and we live our lives together in assurance that whatever may come, we are God’s, we are beloved. Though we may be afraid, we have nothing to fear. For Christians, this act of love is normal. We practice showing our love for one another in the church so that outside these walls we remember that we are God’s servants and messengers on the same level with all other children of God, many of whom have forgotten what it is to love and be loved. As important as it is that we be baptized and share in Holy Communion, it is equally and especially important that we show genuine love for one another as often as we can. The skies are gray this morning, but the weather forecast says the rain doesn’t come until tonight. That rain promises to come with storms. The darkening of the skies calms me somehow, encouraging me to retreat a minute, get myself in order, and focus on the holy moments at hand. This morning the scriptures recall how some people thought the voice of God was thunder, while others clearly heard words. Tonight at our Agapé meal we’ll hear Jesus send Judas out to do that which he must do. We know with Jesus that Judas sets out to betray him, but others think he’s going out for supplies for the coming festival. So much of what we understand–or think we understand–is left to our perspective and interpretation. It might be how we understand written words or how we perceive the present moment, and what we experience is true for us. Simply because we see something as true doesn’t mean it is True, though. The turmoil we read about and the arguments we observe or endure arise from people standing their ground for what is true for the individual. At our best we try to understand everyone’s point of view, where they are coming from, trying to imagine being in their shoes even if we completely disagree with them. One might call this how we exercise empathy. I believe empathy exercised with humility helps us better see the fuller picture of what is real, granting us a bit of objectivity and giving us a chance to increase our personal knowledge and understanding. From this broader perspective, we might hear the voice that also sounds like thunder and marvel with others at the experience of God’s presence. We might see the exchange between Jesus and Judas as meaningful and look back on it later with clarity. We might see our neighbors, be they rich or poor, as people struggling with life or rejoicing in small moments. In all circumstances, even as we make our first impressions and snap judgments, we leave critical judgment alone and focus on the only person over whom we have even the slightest control–our self. Without this focus and work for and on the individual for the benefit of better relationships with one another, we lose sight of the whole. A recent story I heard said we’re truly at risk of losing empathy and retreating into separate camps, evidenced in our increasing polarity socially, politically, economically, etc. From where I see it, the grace of God has no boundaries except those that we construct ourselves. It truly is up to each of us to discern whether we want to stay in relationship with one another, how best to do that safely and for the benefit of the whole, and how we glorify God in the process or continue to betray God. 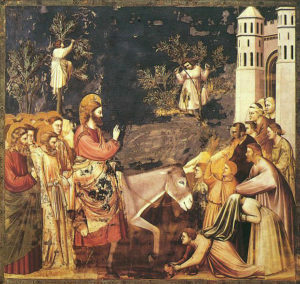 Morning Prayer this morning revisits what inspires the procession on Palm Sunday: Jesus’ entry to Jerusalem. 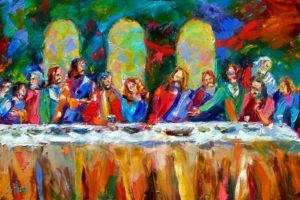 The Eucharistic gospel lesson revisits the dinner party where Mary anoints Jesus’ feet with fragrant nard, much to Judas’ annoyance. Reflection offered by Plough points toward Jesus’ overthrowing the moneychangers in the Temple. All the while, I wonder where I am this Holy Monday. Interestingly, I find myself in relation to the crowd. As news of the Game of Thrones premier covers the news/radio this morning, I realize I’m not “in” with that crowd. Going to pick up a sold-out book club book, I realize that there’s the potential to meet a new crowd of folks locally. Marveling with others at the incredible redbuds and all the spring blossoms and sprouts, I am most definitely one among many getting gardening fever, more than ready to dig in the earth and tend to whatever I can get to grow (or at least dream about growing!). 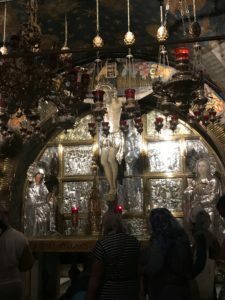 But when it comes to Holy Week, where I am is one among many in a crowd straining to catch a glimpse of Jesus, hoping to witness if not be a recipient of his acts of love. All the effort of my seeking contrasts with the sheer presence of Jesus’ being. Aside from the outburst at the Temple, I imagine Jesus steadily moving forward, carried by the will of man yet sustained by the power of God which is determined to reveal something incredible, surpassing all understanding. For all the shouting of the crowd, be it with “Hosanna!”, at a crowded dinner party, or in the general ruckus of a bunch of people, Jesus’s words and even his presence in silence come as a measured and welcome calm however painful it may be. As part of the crowd, unknowing of God’s ultimate plans, I am reminded to seek those moments of peace and calm, even in the midst of the storms. I am called to follow those distractions that promote a healthy lifestyle and true peace of mind, like taking the dog for a walk, planting a few plants, and making sure we all consume plenty of water. Why? Because ultimately I believe that as Jesus showed us in his life, death, and resurrection, it’s about love, love of the true kind. True love nurtures who we most fully are, which is who God created us to be. So acts of love offered to myself will be life-giving, nurturing. Once I’ve given these loving acts to myself, I might be able to extend them to others. Those acts might look like sharing in mutual love and affection, like Mary anointing Jesus’ feet or sharing a cup of tea with my kids after school. It might look like calling out systems of injustice and signing a petition or calling on legislators. It might look like being part of a crowd, or it might look like being the outsider, caught in all the emotions of each. I wonder what a “crowd” of people who are fully and authentically present might look like for a moment before I think of all of us gathered at church. That crowd includes those present, those who wish they could be there, and anyone else willing to come. It’s a humble, vulnerable, loving bunch, with so much hope. 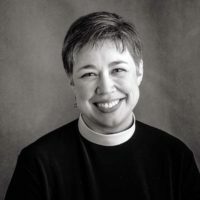 It’s the kind of crowd that extends beyond the church, too, and not often in the mainstream but at the margins. It’s a crowd that’s at risk of getting pulled into the mass mentality, but it’s also a crowd willing to repent when it’s gone astray. It’s a crowd that is yearning, straining to see Jesus, and I realize I am where I need to be.